Square Enix has teamed up with Florence + the Machine for a trio of gorgeous music tracks recorded especially for Final Fantasy XV. The 3 songs in the appropriately titled “Songs from Final Fantasy XV” album include Too Much Is Never Enough, I Will Be and Stand by Me (which was first heard during the Uncovered event earlier this year). Songs from Final Fantasy XV is available on iTunes, Google Play, Amazon and other digital music Stores. Check out the announcement below. 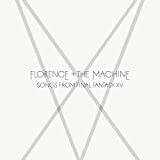 SQUARE ENIX today announced that Songs from FINAL FANTASY XV – a selection of three brand-new tracks recorded for FINAL FANTASY XV by the Grammy-nominated and two-time Mercury Music Prize shortlisted Florence + the Machine is available today. The special collaboration includes three tracks Too Much Is Never Enough, I Will Be and Stand by Me which were recorded at Air Studios in London with producer and composer, Emile Haynie (Kanye West, Lana Del Rey). Too Much Is Never Enough is a cinematic epic, featuring sweeping strings and Florence’s rich, emotive vocals. I Will Be is an evocative ballad, while her rendition of Stand By Me, as first previewed at the UNCOVERED: FINAL FANTASY XV event in March, gives the Ben E. King classic a beautiful, melancholy edge.